Your 7 Main Chakras Explained, And Why They Are Important To Your Health! When it comes to stress and anxiety relief, there is a topic that few people want to get involved in. And the reason only a few people want to get involved in it is because it may challenge their very own core beliefs about the nature of divinity. By default, when anyone mentions or insinuates about the non-physical, people are either thinking you are talking about science, or even worse, death. Yet, the very nature of who we are can help us in understanding out lives, our particular lifestyles and ultimately (sticking to the topic of stress relief) how to use it to feel more better, more energized and more healthier (and in some cases, more mentally sharp). The non-physical is nothing to be ashamed of, but rather embraced. And this shift in mentality can help us not only reduce stress and anxiety in our everyday lives, but also has a knock-on effect on other things as well (including using your very own body, arguably, as a manifestation tool…but that is for another day). You see, at the risk of proselytizing, we are all spiritual beings (of some degree) in a physical body. And believe it or not, your whole body doesn’t just encompass the physical you (i.e. skin, organs etc…) but also the non-physical you. People who have had out-of-body experiences, or near death experiences will testify to this. This non-physical vehicle (if you will) help them, ‘float’ around and do all sorts of stuff. But you don’t have to be a mental or spiritual guy to feel your non-physical body. You can do it using various techniques. Your physical body has points which allows Qi or life energy, to flow in to, ‘feed’ your organs, and these non-physical contact points between your physical body and your non-physical body, are known as, ‘The Chakras’. Now, some of you will already have been put of this article by this point. Unfortunately, some people are so strict with their beliefs (rightly or wrongly) that any mention of the non-physical is automatically associated with the almighty upstairs (or your own particular version). Now, I don’t want to offend anyone, but if you are not open-minded enough to consider the following article, I’m afraid this article may not be for you. But if you can suspend your beliefs for just a few minutes, you’ll find information that can help you reduce stress in numerous ways. If you do, on the other hand, want to know more about your Chakras, than keep reading. Hopefully you’ll take away a lot than you think, and although the exercises may seam downright insultingly obvious, it’s amazing to think how many people don’t know or even do this. Of course, as always, don’t be fooled by the simplicity. Your Chakras are powerful, and have more of an influence than you give them credit for. While I’m doing more research on the correlation between the Chakras and the subconscious (even I have questions about this subject that need answering, as the subconscious also has a big control over your body and your conscious thoughts and actions) needless to say that taking your Chakras into consideration when it comes to any form of negative relief (stress, anxiety, depression, and even suicidal thoughts) will greatly help in recovery and an automatic improvement in ones lifestyle. Try it and find out for yourself! This is quite a long article (over 3300 words) and does talk primarily about your 7 main Chakras, what they do, and how you can balance them. If you do find that there are more tips you can add to this list, please feel free to let me know (I’m all for finding out more:-). Now to begin with, you have over a 100 Chakras from places like your toes and your hands to above your head, but there are 7 main ones. Each one serves a big role in the development of your consciousness, as well as helping your emotional, psychological, mental, spiritual and physical needs. So your Chakras have a huge influence to you and your emotional well-being, stress levels, and your manifesting skills (if you are into anything like the law of attraction, but that is for another day;-). Your Chakras are therefore responsible for your emotional well-being, as well as your general mood, how well you place yourself in society and how well you communicate to your loved ones and the public in general. Your Chakras are the, ‘jack of all trades’ so to speak. And don’t forget, your Chakras are the connection between your soul and your physical body. There are so many great videos online on helping you open your Chakras, and whether you can tell if it is open or closed, but before I carry on, some quick terminology. When we say open or close down your Chakra, what we mean is opening or closing your vortex. Your Chakras are vortices swirling around like a funnel, and you can close one, open one up, and make one spin quicker or slower to stop any unbalances and therefore balance the Chakra which gives you the correct proportion of pure Qi energy flowing into your etheric body and therefore influencing your physical body. By contrast an unbalanced Chakra will give you too much or too little energy, which will negatively physically and emotionally influence you. And this will be reflected by the way, in your behavior. Now your first Chakra is your Root Chakra, and is located at the bottom of your spine and is also the most physical one, and is the one which has the lowest vibration of energy and as a result the lowest wavelength. And that is because it is closer to the physical. Your root Chakra is really your connection to the physical world. Physicality is energy at it’s most slowest vibration. Now if you were an energy healer, you would be able to see the colour red, as this Chakra emits a reddish hue. Now it does govern our physical energies, it governs our survival, securities, passions, our money, our job, really our vigour in life. When it is balanced, you do feel very secure, very stable, very grounded, you do tend to use very good common sense. When it is blocked, you are blocking the flow of life energy, you may ask very deep questions, for e.g., ‘Why am I here?’, you may feel disconnected towards life. And of course, your ability to manifest will be stuttered. If it is over-active, it is the opposite. You will be very greedy, you’ll demand everything, you’re highly strung, almost aggressive, can be reckless and impulsive, even sexually manipulative. When it is under-active, you can be very tired, very lethargic, very weak, afraid of change, you lack confidence, fear of abandonment, all of these are psychological issues, and this is the thing about the Chakras, they will govern your psychology. But you can open the Root Chakra, by visualizing a red flower opening and spinning, by dancing, you can stamp your feet for short periods of time, and you do feel more better as a result. You tend to feel more alive. Interestingly, when I did some research behind this, I discovered that the sense of smell is associated with the Root Chakra, so if you can smell very easily your Root Chakra may be very well balanced. Now how does it feel? Well your Root Chakra feels like a low hum down your spine, a bit tingly at times. You have to be really careful as this should be a good tingling sensation. If it is a bad tingling sensation, you could have a very serious medical condition. So with practice you should be able to differentiate between a good tingling sensation, and a bad tingling sensation. I’ve noticed that mine tingles in a nice way, certainly hearing some bass and listening to some types of music, as music often stimulated the Chakras. The the next main Chakra above is near your sexual organs and is called the Sacral Chakra, and this is located near the sacrum and testes/ovaries that produce the various sexual hormones. Again, if you are an energy healer, or can see non-physical energy, the Sacral Chakra emits an orange colour. This Chakra is involved in relationships, violence, addictions, basic emotional needs and pleasure. It does mentally govern creativity, governs joy and governs enthusiasm, so again, psychological influences there. You know when it is out of balance or blocked, when you are no longer enjoying life, you are very angry or frustrated, your suppressing your emotions, and in some cases no sexual desire, your lacking creativity, have feelings of guilt or jealously. If you do tend to be unemotional, or very stiff, (and we have all met people who are unemotional and are very stiff, they have like a poker facer!) 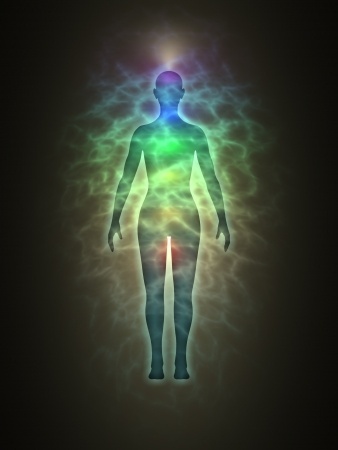 that is also another symptom that this Chakra could be under-active. If it is over-active on the other hand, you can be very emotional most of the time, you can be emotionally attached to other people and can be very sexual as a result. There are many ways to open and balance this Chakra. You can take walks by an ocean or a lake, you can go swimming, you can have relaxing, aromatic baths, you can of course, visualize the colour orange, or an orange flower opening and spinning. And it goes without saying (at the risk of sounding unprofessional or intimate) you can even make love to yourself, or your partner to balance this Chakra. How does it feel? You know when you feel sexual energy in your body. It’s similar to lust, you can feel it around your body, but most notably around your sexual organs. The next Chakra is your Solar Plexus Chakra, (or sometimes called your Naval Chakra, as it is located above your navel, or belly button). The colour this Chakra emits is yellow. You would need to work on this if you lack self esteem, if you lack will power (if you give up easily), if you experience aggression, anger, if you have difficulty expressing your feelings, if you have trouble getting things done, stuff that comes to productivity and completion of projects. Feeling tired can be an indication of an underused, or blocked Solar Plexus Chakra. If you have too many negative thoughts, suffer from anxiety, that could also be a symptom of a blocked, out of balance Chakra. It’s all about asserting yourself in a group, and if your Chakra is under-active, you do tend to be indecisive, sometimes passive. Of course, if it is over-active, the complete opposite will occur, and you will be domineering at times, sometimes aggressive (and we have all met people who seem to dominate the group). To open and balance this Chakra, you can take a walk in the sun, take regular walks, wear yellow clothes, do things that spark your interests and passions, and another great way is being in the, ‘Now’. When you are in the, ‘Now’, you feel that rush of Qi energy rushing into your body via your Solar Plexus Chakra. Now the Chakra above, is your Heart Chakra and is located outside of your Heart. This emits a greenish hue and is also deemed the, ‘gateway to the spiritual world’ hence why if you come from love, (a little tip, if you can feel unconditional love for around a few minutes, not only will it help you to reduce your stress, but you can also reduce any future fear-based scenario. Out-of-body explorers already understand this) you are really using the spiritual world, which of course creates the physical world. We are in a spiritual multi-verse. When it is opened, you feel love, kindness, compassion, you are affectionate, you’re very friendly, you work in harmony, and you work at creating harmonious relationships. If it is closed, or out of balance, you can be very distant and cold (something I was guilty off in years gone by). You do need to work on it of course, if you have problems with relationships, if you have problems keeping friends, if you feel lonely all the time, if you feel unloved, if you are unable to love yourself and others and you have difficulty letting people into your life. You can also catch a cold quite easily because your Heart Chakra does tend to work in close relationship with your immune and nervous system, hence the psychological and health influences. You can open or balance it in several ways. You can let go of negative people, not always easy of course…so you can do the next best thing, and forgive them (which helps you to love unconditionally) and letting go of anger from unwanted past experiences (forgiveness should help you with that as well). Wearing green clothing can sometimes open and balance your Heart Chakra as well as surrounding yourself with things you enjoy as well as imagining hugging someone you love and admire, and feeling that love spread across your body. When you have opened the Heart Chakra or balanced it, you feel the feeling of love emanate from the vortex, and it will soon spread across your body. Feelings of fear soon dissipates, as fear cannot exist when you feel, ‘unconditional love’. The next Chakra is the Throat Chakra, and is all about self-expression, and emits the colour light blue. It is located at the throat. You know when you need to work on it, when you find it hard to express your self freely and find it hard to communicate, you can sometimes find yourself telling white lies most of the time; you find it difficult to listen to other people, your lacking in self esteem and have speech problems. You know when it is under-active when you don’t speak much, you are very introverted, perhaps shy, even not speaking your personal truth. Opening or balancing your Throat Chakra can be achieved by singing out load very loudly, by speaking louder than usual, and by saying something as simple as, ‘Hi’. Not many people realize this… just saying, ‘Hi’ to people on the street is a great way of doing this. Reading poetry out loud is another great way of doing it, as well as standing firm in your opinions, in a non-argumentative way. If the opinion is going to create an argument, the best thing to do is to stop the opinion. When it is open, you don’t have any problems in communicating, and may consider yourself to be a bit of an artist. The next one is one that most people are curious with. It is often talked about, and one that has the most attention, and that is your 3rd Eye Chakra, located between your eyebrows, but slightly above. It is all about insight and visualizing. When it is opened, you have very good intuition, but you may also tend to fantasize a lot. You need to work on it if you are not very good at thinking for yourself, if you find yourself relying on other people, like your parents, and your friends; you may be rigid in your thinking and rely on your beliefs too much, which may lead to confusion. If you suffer from panic and anxiety attacks and you cannot think clearly or if you have trouble concentrating, and are having problems finding a purpose in life, this could also be an indication. Another indication is that you lack goals for example, if you lack faith or you cannot find your own inner voice. One thing I read, is that it could be blocked or very imbalanced if you have learning disabilities or if you have hearing problems, so that’s worth bearing in mind (no pun intended;-). If it is over-active, you tend to live in fantasy land too much, and in some cases may even hallucinate. If you are not careful, you do tend to lose focus very easily. The 3rd Eye Chakra is the gateway to intuition and higher perception and people who have a strong vibration with this Chakra are people we would call psychics. We are all psychics, and we all have that ability, but most of us have to work on it as you would do like a muscle. It can be opened/ balanced by being in the, ‘Now’, which helps reduce mental chatter, or meditating with Yoga. Theta and Delta, brainwave states between 0.5hz to 7 Hz (the measurement of the electrical activity of your brain, commonly before you go to sleep and when you wake up) are also a good way of opening up this Chakra. Now unless you are a trained meditation expert, you would need CD’s to help you achieve Theta or Delta. A package I personally recommend is the ARVARI course, which not only helps you get to Delta (which lowers your mental noise), but also helps you reduce your stress and allows you to manifest a lot easily, as you are very close to your soul. The feeling of an active 3rd Eye Chakra is the equivalent of someone gently tapping your forehead. It is like a tiny, throbbing sensation, and in some peoples cases, can cause small headaches if it is being opened, or balanced for the first time. The final Chakra is one that is above your head, and is called your Crown Chakra, which emits a whitish hue and is your connection to source, higher consciousness, or essentially your soul. Remember what I said about the root one being the lowest vibration? Well your Crown Chakra is your highest vibration because it is the vibration closest to your soul/higher self. When it is blocked, unbalanced, you are not aware of your spirituality, you have very rigid thinking, you may even suffer from depression or a mental disorder, and you may have a weak immune system or you suffer from chronic fatigue. On the other side, if you intellectualize a lot, obsessed with spirituality, or neglect your basic bodily needs, it may be over active and you may need to work on it. When it is balanced, you do connect to your inner being, and you feel a oneness with divine source; you feel a sense of bliss, with an understanding of your life’s purpose. You become more aware of the beauty around you, with nature, and you feel its natural energy. You are happier because you are connected to the, ‘all that is’, and as a result, you don’t feel lonely. This means you are unprejudiced, and are aware of yourself and this world. You become very non-judgmental, and exhibit unconditional love. To open this Chakra or balance it, you do need to meditate daily, it’s as simple as that! Take time to be still, being in the, ‘moment of now’ really helps. Try and be thankful and grateful for everything you are and have. By being thankful, you uplift your soul. This connects you more to the spiritual aspect of yourself very quickly. Again, being in Delta also helps in this case. So, this is just a quick run-down of the Chakras, as they are pretty essential, not just to manifesting your reality, but also to your emotional, psychological and physical well-being. You can also help balance your Chakras when you have an out-of-body experience, by using the healing power of love to flow though your consciousness and direct it to one of your Chakras, and as a result, begin to self-heal in that way. Ilchi Lee Chakra Healing: What will happen if the Chakras are Not Healed? Previous PostPrevious Reducing stress in the intense workplace: Is it really impossible? Next PostNext How To Rid Yourself Of Depression In 4 Stupidly Easy Ways!